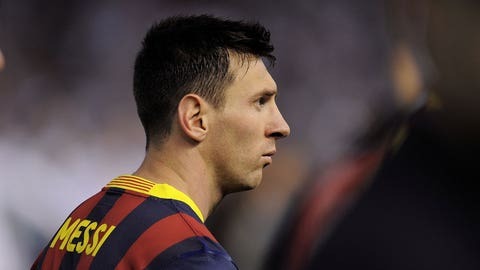 Barcelona may decide to cash in on their prize asset Lionel Messi. Manchester City are set to lose out to Atletico Madrid on the signing of Argentine wonderkid Angel Correa, the San Lorenzo forward dubbed the next Sergio Aguero. Liverpool are hopeful they can complete the £12m signing of Barcelona forward Cristian Tello if the Catalan club are successful in their appeal against a FIFA-imposed transfer ban. Arsenal defender Laurent Koscielny has promised to give the Gunners an answer on his future before the World Cup finals begin, amid reports of interest from Paris St-Germain. Manchester United are keen on Marseille’s teenage left-back Benjamin Mendy. Southampton midfielder Jack Cork is a summer target for Fulham, Swansea and Crystal Palace. Oriol Romeu is open to quitting Chelsea for good this summer. The Spanish midfielder has spent this season on loan at Valencia and they want him on a permanent deal. Liverpool manager Brendan Rodgers claims skipper Steven Gerrard is the best holding midfield player in Europe. West Ham are lining up a £5million deal for Leeds striker Ross McCormack. Manchester United midfielder Juan Mata says manager David Moyes has the full support of senior players at the club, despite enduring a disappointing debut season in the Old Trafford dugout. Manchester City’s owners will stick with Manuel Pellegrini as boss – despite their dramatic title collapse. Luke Shaw and Adam Lallana are wanted by Premier League big guns but England hitman Rickie Lambert is happy to stay put. Liverpool chief Brendan Rodgers says his skipper Steven Gerrard has now proved he can be the best in two different positions. West Ham have launched a fresh bid for Sporting Lisbon striker Islam Slimani â having missed out on his services in January. Yannick Bolasie could be on his way out of Crystal Palace after talks over a new contract stalled. Valencia have offered Manchester United the chance to sign French centre-back Adil Rami for £10m after a proposed move to AC Milan stalled. David Moyes should not blame Manchester United’s failings this season on the quality of his squad, Everton boss Roberto Martinez claimed. Roma are showing interest in a deal for Tottenham midfielder Paulinho. Dutch legend Marco van Basten has agreed a two-year deal to take over at Eredivisie side AZ Alkmaar. Lionel Messi believes Barcelona now him see him as a saleable asset and not their untouchable star player, it has been claimed by well-informed Catalan sports channel Esport3. Blackburn are keen on Cowdenbeath striker Kane Hemmings, who is out of contract at the end of the season. Leeds boss Brian McDermott was at Rochdale on Friday to reportedly cast an eye over Southend goalkeeper Daniel Bentley. Chelsea midfielder Oriol Romeu says he is happy to make his loan stay at Spanish outfit Valencia permanent, but insists the final decision rests with his parent club. Some Arsenal players will be forced to take a 25% pay cut if the club fail to qualify for next season’s Champions League. Eden Hazard faces a race against time to prove his fitness for Chelsea’s Champions League trip to Atletico Madrid. Espanyol keeper Kiko Casilla says he does not want to leave the club, despite reports of interest from Arsenal and Manchester United. David Moyes makes his first return to Goodison Park tomorrow demanding some respect from the Everton boo boys.